Big news in the hotel industry happened today: the Marriott and SPG merger completed following Chinese regulatory approval. The merger is significant because of the uncertainty it brings for folks who are loyal to either SPG or SPG Starpoints. Starpoints are often viewed as one of the most valuable point currencies because you can transfer them to a large number of airline programs for favorable rates (1:1 with a 5,000 bonus for transferring 20,000). Marriott is valuable because it offers Hotel + Air Package where you can redeem, for example, 200,000 Marriott points for 7 nights at a Category 5 Marriott hotel and 55,000 United miles. 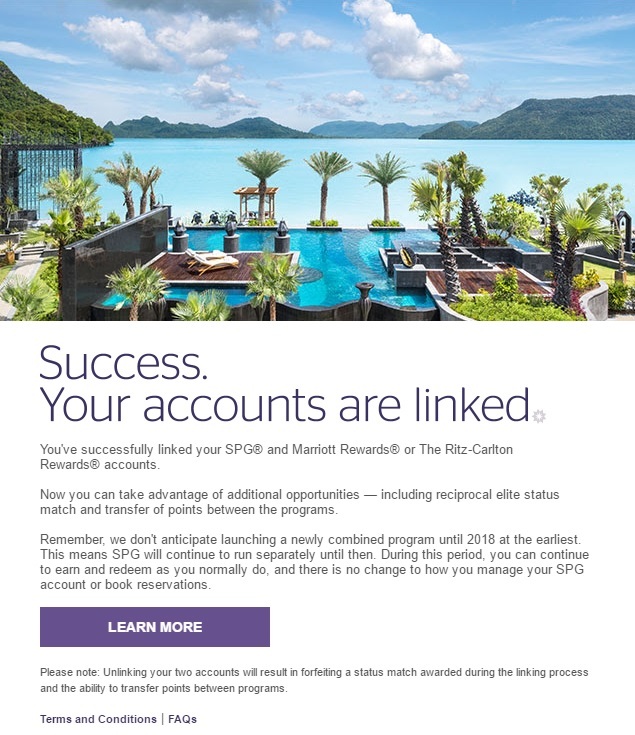 Click here to link your SPG, Marriott, and Ritz Carlton accounts. The process takes less than a minute and the status match occurs instantly–if you have status at one program, you will automatically status match into another program. My Amex Platinum card gives me Gold status at Hilton and SPG. I value the Hilton Gold status more because I get free breakfast at some properties, but SPG Gold status does not provide free breakfast. Since I have SPG Gold status, I automatically status matched to Marriott Gold status which comes with complimentary executive lounge and daily continental breakfast access. While I do not have any Marriott stays planned for the foreseeable future, the newly added free breakfast benefit will convince me to take a closer look at their properties in the future. Once you link your SPG, Marriott, and Ritz Carlton accounts, you can transfer Starpoints to Marriott Rewards at a 1:3 ratio. Don’t get too excited, Marriott Rewards are less valuable than airline miles (hence the larger transfer ratio) but you can stack this transfer ratio with the Marriott Hotel + Air Package for a tremendous redemption opportunity. In the upper right-hand corner of the screenshot, you can redeem 270,000 Marriott Rewards for 132,000 United miles and seven nights at a Category 1-5 Marriott property. You would need to transfer 90,000 Starpoints (remember 3:1 transfer ratio) to reach 270,000 Marriott Rewards. If you had transferred those Starpoints directly to the UnitedPlus program, you would only receive 110,000 United miles (90,000 plus 20,000 in transfer bonuses). The merger will let you redeem for 22,000 extra United miles and 7 free nights at a Category 5 hotel! Marriott has 636 Category 5 hotels located around the world. Marriott has yet to announce how it will finish integrating the Marriott and SPG loyalty programs, so uncertainty about the future value of the programs still exists. If the final merger looks anything like the initial linked accounts, SPG members will make out just fine. Be the first to comment on "SPG and Marriott Merger Complete: 3 Things You Need to Do"